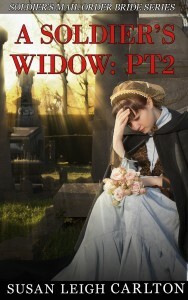 My latest offering is “A Soldier’s Widow Part 2” priced at $2.99 on Amazon. “A Soldier’s Widow: Pt 2 is a serial of over 28,500 words. This is the conclusion of the story begun in Part 1. Part 1: This is the story of Miriam Ponder of Yorkville, South Carolina. Miriam became a widow on November 24, 1863, when her husband, Hiram was killed during the Battle of Missionary Ridge. His name never appeared on the casualty lists and she was unaware of his death until a few months after the end of the war. Part 2: The conclusion of a two-part western historic romance about a war widow and her desperate search for happiness and security. Miriam Ponder traveled three fourths of the way across the country to become a mail order bride, only to find her prospective groom fought in the same battle that took her husband but he was on the other side. Through compassion and understanding they overcome this hurdle only to be confronted with one of the worst things that can happen to a couple, compounded by an incredible act of insensitivity. The marriage is badly broken. Can it be saved by close and caring friends? Read A Soldier’s Widow: Part 2.